Business card sizes are different across the world and even in the same country there can be a range of different sizes used depending on who is doing the printing. There is usually a basic standard business card dimension which is the most popular in a country, so graphic designers should use these sizes if they do not know who will be actually printing the cards; which is often the case these days. The diagram below illustrates the variation in dimensions by superimposing all of the regular horizontal sizes on top of each other. As you can see, the lengths range from 80 to 91 mm, with heights ranging from 45 to 57 mm. 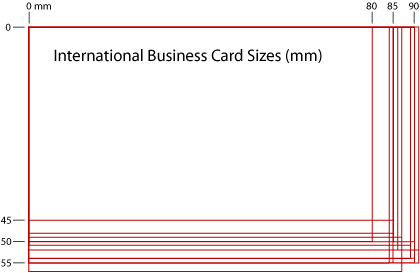 The following reference lists the regular business card dimensions in metric mm, cm, inches and pixel sizes for countries across the world and also for some of the most popular online business card printers, who incidentally, use their own unique measurements to reduce the costs involved in printing. 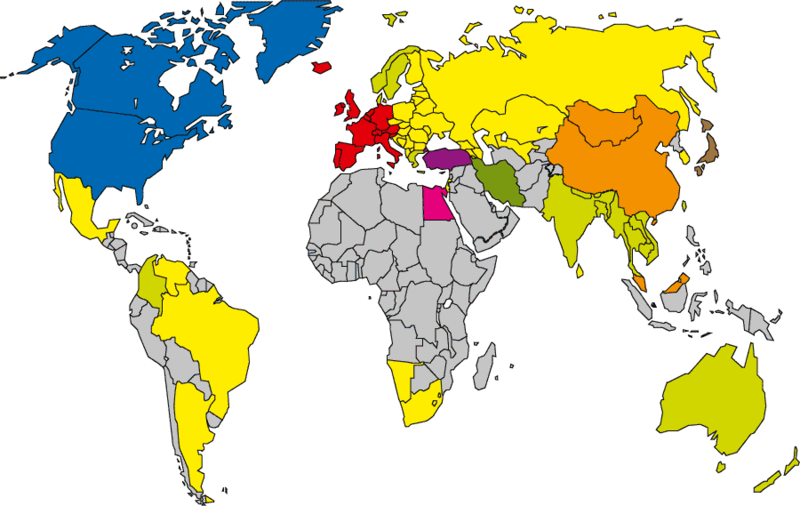 The colour coded map of the world below shows the standard or most popular dimensions for each country. These figures refer to the final trimmed business card size and do not include 'bleed'. If a design element, such as the background, extends to the edge of the card, then an extra amount needs to be added so the card does not show any white edges after trimming. Common bleeds are 1/8th of an inch for North America and 3 mm for the rest of the world. Bleed can vary between commercial printers, anything from 1.5 mm (see Visaprint below) to 5 mm. I was unable to find data for every country so the grey areas on the map are unknown. United Kingdom UK: 85 x 55 mm, 8.5 x 5.5 cm, 3.346 x 2.165 inches, 1004 x 650 pixels (with 3mm bleed: 91 x 61 mm, 9.1 x 6.1 cm, 3.583 x 2.402 inches, 1075 x 720 pixels). Note: the pixel measurements are based on a resolution of 300 dpi. United States US: 88.9 x 50.8 mm, 8.89 x 5.08 cm, 3.5 x 2 inches, 1050 x 600 pixels (with 1/8th inch bleed: 95.25 x 57.15 mm, 9.525 x 5.715 cm, 3.75 x 2.25 inches, 1125 x 675 pixels). Australia AU: 90 x 55 mm, 9 x 5.5 cm, 3.543 x 2.165 inches, 1063 x 650 pixels (with 3mm bleed: 96 x 61 mm, 9.6 x 6.1 cm, 3.78 x 2.402 inches, 1134 x 720 pixels). Canada CA: 88.9 x 50.8 mm, 8.89 x 5.08 cm, 3.5 x 2 inches, 1050 x 600 pixels (with 1/8th inch bleed: 95.25 x 57.15 mm, 3.75 x 2.25 inches, 1125 x 675 pixels). New Zealand NZ: 90 x 55 mm, 9 x 5.5 cm, 3.543 x 2.165 inches, 1063 x 650 pixels (with 3mm bleed: 96 x 61 mm, 9.6 x 6.1 cm, 3.78 x 2.402 inches, 1134 x 720 pixels). Western Europe; United Kingdom GB, Ireland IE, France FR, Spain ES, Portugal PT, Belgium BE, Germany DE, Netherlands NL, Italy IT, Austria AT, Switzerland CH, Luxembourg LU, Slovenia SI: 85 x 55 mm, 8.5 x 5.5 cm, 3.346 x 2.165 inches, 1004 x 650 pixels (with 3mm bleed: 91 x 61 mm, 9.1 x 6.1 cm, 3.583 x 2.402 inches, 1075 x 720 pixels). Eastern European countries; Poland PL, Czech Republic CZ, Slovakia SK, Hungary HU, Croatia HR, Bosnia and Herzegovina BA, Serbia, Montenegro, Albania AL, Macedonia MK, Bulgaria BG, Romania RO, Moldova MD, Ukraine UA, Belarus BY, Lithuania LT, Latvia LV, Estonia EE, Finland FI, Georgia GE, Armenia AM, Azerbaijan AZ: 90 x 50 mm, 9 x 5 cm, 3.543 x 1.969 inches, 1063 x 591 pixels (with 3 mm bleed; 96 x 61 mm, 9.6 x 6.1 cm, 3.78 x 2.402 inches, 1134 x 720 pixels). North and South European countries; Norway NO, Sweden SE, Denmark DK, Greece GR: 90 x 55 mm, 9 x 5.5 cm, 3.543 x 2.165 inches, 1063 x 650 pixels (with 3mm bleed: 96 x 61 mm, 9.6 x 6.1 cm, 3.78 x 2.402 inches, 1134 x 720 pixels). Iceland IS: 85 x 55 mm, 8.5 x 5.5 cm, 3.346 x 2.165 inches, 1004 x 650 pixels. Also, 90 x 50 mm, 9 x 5 cm, 3.543 x 1.969 inches, 1063 x 591 pixels. Russia RU, Kazakhstan KZ, Uzbekistan UZ: 90 x 50 mm, 9 x 5 cm, 3.543 x 1.969 inches, 1063 x 591 pixels. Iran IR: 85 x 48 mm, 8.5 x 4.8 cm, 3.346 x 1.89 inches, 1004 x 567 pixels. China CN, Hong Kong HK, Singapore SG, Mongolia MN: 90 x 54 mm, 9 x 5.4 cm, 3.543 x 2.126 inches, 1063 x 638 pixels. Malaysia MY: 90 x 54 mm, 9 x 5.4 cm, 3.543 x 2.126 inches, 1063 x 638 pixels. The following dimensions are also used in Malaysia; 91 x 52 mm, 89 x 54 mm, 86 x 52 mm. India IN, Taiwan TW, Vietnam VN, Thailand TH, Cambodia KH, Laos LA, Myanmar (Burma) MM, Bangladesh BD, Bhutan BT, Nepal NP: 90 x 55 mm, 9 x 5.5 cm, 3.543 x 2.165 inches, 1063 x 650 pixels. Sri Lanka LK: 90 x 50 mm, 9 x 5 cm, 3.543 x 1.969 inches, 1063 x 591 pixels. South Korea KR: 90 x 50 mm, 9 x 5 cm, 3.543 x 1.969 inches, 1063 x 591 pixels. Japan JP: 91 x 55 mm, 9.1 x 5.5 cm, 3.583 x 2.165 inches, 1075 x 650 pixels. Turkey TR: most popular size 85 x 50 mm, 8.5 x 5 cm, 3.346 x 1.969 inches, 1004 x 591 pixels. These other sizes are often used as well; 85 x 45 mm, 80 x 50 mm, 85 x 55 mm, 90 x 50 mm, 90 x 55 mm. South Africa ZA, Namibia NA: 90 x 50 mm, 9 x 5 cm, 3.543 x 1.969 inches, 1063 x 591 pixels. Namibia also uses 85 x 55 mm. Egypt EG: 87 x 57 mm, 8.7 x 5.7 cm, 3.425 x 2.244 inches, 1028 x 673 pixels. Israel IL: 90 x 50 mm, 9 x 5 cm, 3.543 x 1.969 inches, 1063 x 591 pixels. Mexico MX, Brazil BR, Argentina AR, Venezuela VE: 90 x 50 mm, 9 x 5 cm, 3.543 x 1.969 inches, 1063 x 591 pixels. Colombia CO: 90 x 55 mm, 9 x 5.5 cm, 3.543 x 2.165 inches, 1063 x 650 pixels. Vistaprint: 87 x 49 mm, 8.7 x 4.9 cm, 3.43 x 1.93 inches, 1028 x 579 pixels (with 1.5 mm bleed; 90 x 52 mm, 9 x 5.2 cm, 3.54 x 2.05 inches, 1062 x 615 pixels). Moo Standard Cards: 84 x 55 mm, 8.4 x 5.5 cm, 3.307 x 2.165 inches, 992 x 650 pixels (with 2 mm bleed; 88 x 59 mm, 8.8 x 5.9 cm, 3.465 x 2.323 inches, 1039 x 697 pixels). Moo Mini Cards: 70 x 28 mm, 7 x 2.8 cm, 2.756 x 1.102 inches, 827 x 331 pixels (with 2 mm bleed; 74 x 32 mm, 7.4 x 3.2 cm, 2.913 x 1.26 inches, 874 x 378 pixels). Zazzle Standard Cards: 88.9 x 50.8 mm, 8.89 x 5.08 cm, 3.5 x 2 inches, 1050 x 600 pixels. Note: no need to include any bleed (I think they must print the cards slightly larger and then trim them down to the correct size). Zazzle Chubby Cards: 88.9 x 63.5 mm, 8.89 x 6.35 cm, 3.5 x 2.5 inches, 1050 x 750 pixels. Zazzle Skinny Cards: 76.2 x 25.4 mm, 7.62 x 2.54 cm, 3 x 1 inches, 900 x 300 pixels.